How is the Testmasters PE Electrical Exam Course Set Up? Review Course: Theoretical concepts are explained to refresh and give students an understanding of important PE Electrical Exam topics. Many example problems are worked out in class to reinforce these concepts. The focus of the Testmasters PE Electrical review course is to review the important concepts needed for the exam and begin the development of the student’s problem-solving proficiency. Problem Solving Workshops: The workshops supplement the review courses for the examination. Since the actual examination is focused on problem solving, the PE Electrical Exam course will provide intensive problem solving practice to enable students to perform at their highest capabilities on the exam. The Testmasters PE Electrical course workshops focus on the depth (PM) examinations, which can certainly help to increase the score in the breadth (AM) part of the examination. 100% of classroom time is devoted to solving exam-like problems and strengthening the student’s proficiency within a timed environment, similar to that on exam day. 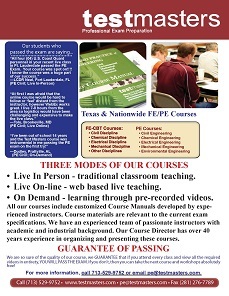 The PE Electrical Exam Test Course will cover 63 hours of classroom instruction. Review Course and Workshops: This 63-hour review course and workshops prepares students taking the Power sub discipline. The Power course covers selected topics from Electrical Circuits, Power Systems, NEC, and Digital Systems. What is the format of the PE Electrical Exam? The PE (Electrical) exam consists of three separate exams divided by sub discipline. Each sub discipline is independent of the other. The three sub discipline of the exam are Power, Electrical & Electronics, and Computers. We offer a course only for the Power sub discipline. PE (Electrical): The PM sub disciplines are in Computers, Power, and Electronics / Controls / Communications.